Font Zoomer is the application that allows you to fully customize font in your handset. 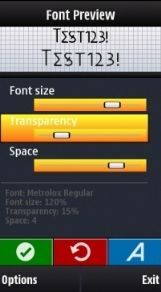 Using Font Zoomer you can replace system font and change size,transparency and space between characters. modify following font parameters : font size, font transparency and space between chars. + Font List panel - On the Font List panel you can select font type. Somyac FontZoomer v2.40 Lite S60v3 S60v5 Symbian^3 Signed URL http://symbian2share.blogspot.com/2011/09/somyac-fontzoomer-v240-lite-s60v3-s60v5.html. NEXT.